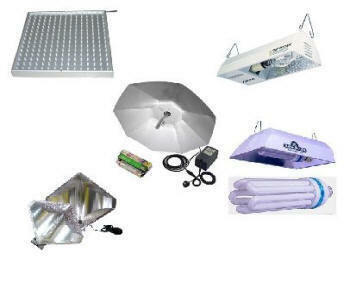 There are three primary grow light choices for hydroponics gardening: Fluorescent, Metal Halide (MH), and High Pressure Sodium (HPS). Fluorescent grow lights give off low heat, but consequently, lower light output. Full-spectrum fluorescent lights are fine for ornamental houseplants and leafy produce like lettuce and spinach, and for herbs. They also work great for starting seedlings, cuttings, and clones. 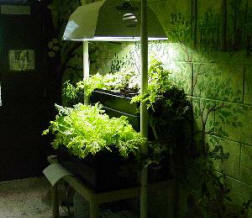 They are the cheapest lights you can buy for a hydroponics garden, and are nice and COOL. You can find small "Gro Sticks" at Walmart for $10 for your seedling nursery. BUT, fluoros just don't have the proper spectrum needed for fruiting vegetables and flowering plants. New T5 and T8 high output systems are now available that produce enough lumens to grow various plants to maturity, but they just don't provide the most ideal lighting for optimum production of fruits and flowers. If you're pretty sure you're going to limit your hydroponics gardens to leafy veggies... lettuces, chard, spinach, herbs... then go ahead with a T5 fixture. But if you think you might one day grow veggies or flowers... then go with a High Intensity Discharge (HID) lamp. It can be used for all types of hydroponics crops. Metal-halide lamps produce high light output for their compact size, making them a powerful and efficient gardening light source. Rare earth metal salts are added to a mercury vapor lamp, which improves luminous efficiency. Like most HID lamps, metal halide lamps operate under high pressure and temperature, and require special fixtures to operate safely. Since the lamp is small compared to a fluorescent or incandescent lamp of the same light level, a reflector is essential to direct the light efficiently onto your garden. Metal Halide grow lights are green/blue/violet-oriented in the spectrum, depending upon the Kelvin temperature, and is the best light when natural sunlight is not available. It also is particularly appropriate during the vegetative growth stages. If you can only afford one lamp, get a 400 or 600 watt MH. 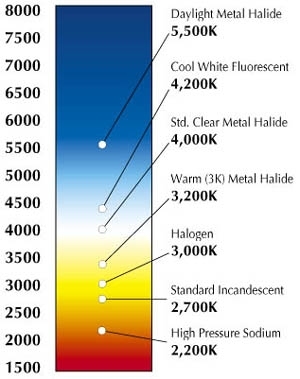 High-pressure sodium (HPS) lamps are also a small but highly efficient light source. They contain additional elements such as mercury, and produce a dark pink glow when first struck, and a pinkish orange light when warmed. High Pressure Sodium grow lights are red/orange-oriented in the spectrum and the superlative lamp for secondary or supplemental lighting and promotes budding, flowering and fruiting. A 400 or 600 watt HPS makes a fine addition to your hydroponics system. The best solution is to use a MH lamp for the vegetative stage of growth, and switch to an HPS for the flowering and fruiting stage. WHAT? CAN'T AFFORD TWO HID LAMPS? Looking for the perfect frame in which to place your hydro system? Look no further: PVC HYDRO STAND .